Game Review: Idle Miner Tycoon - The next big clicker game! Game Review: Idle Miner Tycoon – The next big clicker game! Idle Miner Tycoon is a tycoon and clicker game created by Kolibri Games from Berlin, Germany. You may remember them as Fluffy Fairy Games, a brand that’s known for producing quality idle clicker titles that are actually fun to play. 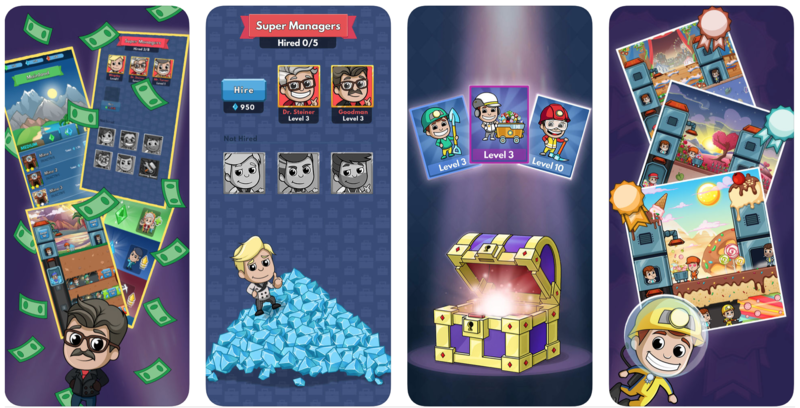 At first glance, Idle Miner Tycoon may seem like another rehashed clicker game on the iOS and Android platform, but Deconstructor of Fun called it a “smash hit“, with impressive numbers such as more than 50 million downloads and consistent top rankings. The game is simple enough but you’ll quickly fall into a hypnotizing, addictive flow of endless optimization and things to do. Moreover, players can look forward to next-gen graphics and an absolutely stunning design that adds to the overall appeal of the game. Everyone starts with a small mine that grows in size the longer you spend time with it. As boss, you’re tasked with handling day-to-day operations and all the aspects that come with it, i.e., coordinating workflows, hiring managers and making your miners work to get the cash flow going. Take on challenges, work out the best mining strategy to create massive profits and a huge mine in the process. Idle Miner Tycoon is 100% free to download on your iPhone or Android phone. Go to Google Play or the App Store and tap on the download button to start your industrial tycoon journey. There are zero in-app purchases and no paywalls to speak of. The game runs fine without an internet connection while letting you enjoy all the features that make mining easier. Idle Miner Tycoon will have you tapping on the first few minutes of the game, but it’s all about automating the workflow to generate income. Hire managers and give them various tasks, get more miners and have them work even when you’re not present. You, the boss will make important decisions- get new managers, open up mining shafts or hurry up the production rate? More than just a simple idle game, you can use in-game dashboards and KPIs and know where to spend your money in. Remember, you’ll need a balance of economy, helping the business and building up your empire to be ultimately successful. Bigger mines, more managers and workers equal bigger cash flow. How your empire grows will depend on your upgrade and hiring decisions, so choose smart and don’t be afraid to experiment. Every manager you hire will have its own strength and weaknesses. There are more than 20 different mines and managers that provide unique effects. Moreover, there are plenty of different resources to mine, including Jade, Amethyst, Gold, Ruby and Moonstone. The awesome thing about Idle Miner Tycoon is that your mine keeps working even when you’re away. The game can run offline and doesn’t require an internet connection. As the boss, you can check in every now and then to see how your mine is doing; make necessary adjustment, upgrades and managerial decisions, then close the app and let the mine run itself in your behalf.